As of April 10, 2019[update], the United States Senate has confirmed 97 Article III judges nominated by President Trump, including 2 Associate Justices of the Supreme Court of the United States, 37 judges for the United States Courts of Appeals, 58 judges for the United States District Courts, and 0 judges for the United States Court of International Trade. There are currently 60 nominations to Article III courts awaiting Senate action, including 5 for the Courts of Appeals, 53 for the District Courts, and 2 for the Court of International Trade. There are currently 8 vacancies on the U.S. Courts of Appeals, 125 vacancies on the U.S. District Courts, 4 vacancies on the U.S. Court of International Trade, and 16 announced federal judicial vacancies that will occur before the end of Trump's first term (2 for the Courts of Appeals and 14 for District Courts). Trump has not made any recess appointments to the federal courts. In terms of Article I courts, as of March 5, 2019[update], the Senate has confirmed 7 judges nominated by Trump, including 2 for the United States Tax Court, 4 for the United States Court of Appeals for Veterans Claims, and 1 for the United States Court of Appeals for the Armed Forces. There are currently 9 nominations to Article I courts awaiting Senate action, including 4 for the United States Court of Federal Claims, 4 for the Tax Court, and 1 for the United States Court of Military Commission Review. Trump designated Susan G. Braden and Margaret M. Sweeney as chief judges of the Court of Federal Claims. 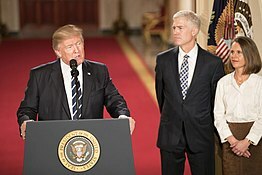 Donald Trump with his first Supreme Court nominee, Neil Gorsuch. 15 Claria Horn Boom E.D. Ky.
^ a b c d e f g h i j k l m n o p q Initial nomination expired on January 3, 2018. Subsequently renominated on January 8, 2018. ^ a b c d e f g h i j k l m n o p q r s t u v w x y z aa ab ac ad ae af ag ah ai aj ak al am an ao ap aq ar as at au Initial nomination expired on January 3, 2019. Subsequently renominated on January 23, 2019. ^ a b c d e f g h Initial nomination expired on January 3, 2019. Subsequently renominated on February 6, 2019. ^ Originally nominated on April 5, 2016, by President Barack Obama. That nomination expired on January 3, 2017. Renominated by President Trump on May 8, 2017. ^ Originally nominated on December 16, 2015, by President Obama. That nomination expired on January 3, 2017. Renominated by President Trump on May 8, 2017. ^ Originally nominated on February 25, 2016, by President Obama. That nomination expired on January 3, 2017. Renominated by President Trump on August 3, 2017. ^ Originally nominated on March 15, 2016, by President Obama. That nomination expired on January 3, 2017. Renominated by President Trump on September 11, 2017. ^ Originally nominated on March 15, 2016, by President Obama to the Eastern District of Texas. That nomination expired on January 3, 2017. Renominated by President Trump to the Northern District of Texas on September 7, 2017. ^ Originally nominated on February 26, 2008, by President George W. Bush. That nomination expired on January 2, 2009. Renominated by President Trump to a different seat on the same court on December 20, 2017. ^ Originally nominated on July 30, 2015, by President Obama. That nomination expired on January 3, 2017. Renominated by President Trump on December 20, 2017. ^ Originally nominated on July 30, 2015, by President Obama. That nomination expired on January 3, 2017. Renominated by President Trump to a different seat on the same court on December 20, 2017. ^ Originally nominated on July 10, 2008, by President Bush. That nomination expired on January 2, 2009. Renominated on April 28, 2016, by President Obama to a different seat on the same court. That nomination expired on January 3, 2017. Renominated by President Trump on December 21, 2017. ^ a b Initial nomination expired on January 3, 2018. Subsequent renomination on January 8, 2018, expired on January 3, 2019. Renominated again on January 23, 2019. ^ Originally nominated on September 8, 2015, by President Obama. That nomination expired on January 3, 2017. Renominated by President Trump on April 12, 2018. That nomination expired on January 3, 2019. Subsequently renominated on TBD. ^ Originally nominated on July 30, 2015, by President Obama. That nomination expired on January 3, 2017. Renominated by President Trump on May 15, 2018. That nomination expired on January 3, 2019. Subsequently renominated on TBD. ^ Originally nominated on September 13, 2016, by President Obama. That nomination expired on January 3, 2017. Renominated by President Trump on May 15, 2018. That nomination expired on January 3, 2019. Subsequently renominated on TBD. ^ a b c d e Originally nominated on May 15, 2018. That nomination expired on January 3, 2019. Subsequently renominated on TBD. ^ Originally nominated on September 8, 2015, by President Obama. That nomination expired on January 3, 2017. Renominated by President Trump on June 11, 2018. That nomination expired on January 3, 2019. Subsequently renominated on TBD. ^ Originally nominated on June 11, 2018. That nomination expired on January 3, 2019. Subsequently renominated on TBD. ^ a b Originally nominated on June 18, 2018. That nomination expired on January 3, 2019. Subsequently renominated on TBD. ^ Originally nominated on July 30, 2015, by President Obama. That nomination expired on January 3, 2017. Renominated by President Trump on July 17, 2018. That nomination expired on January 3, 2019. Subsequently renominated on January 23, 2019. ^ Originally nominated on July 31, 2008, by President Bush. That nomination expired on January 2, 2009. Renominated by President Trump to a different seat on the same court on November 13, 2018. That nomination expired on January 3, 2019. Subsequently renominated on January 23, 2019. ^ Originally nominated on March 15, 2016, by President Obama. That nomination expired on January 3, 2017. Renominated by President Trump to a different seat on the same court on January 17, 2019. ^ Previously nominated to the Court of Appeals for the Ninth Circuit on November 13, 2018, a nomination which expired on January 3, 2019. ^ Originally nominated on July 30, 2015, by President Obama. That nomination expired on January 3, 2017. Renominated by President Trump to a different seat on the same court on March 5, 2019. ^ Originally nominated on November 15, 2007, by President Bush. That nomination expired on January 2, 2009. Renominated by President Trump to a different seat on the same court on March 26, 2019. ^ Originally nominated on May 4, 2015, by President Obama. That nomination expired on January 3, 2017. Renominated by President Trump to a different seat on the same court on August 3, 2017. ^ Originally nominated on February 25, 2003, confirmed by the Senate on April 3, 2003, and appointed to the Tax Court on June 30, 2003, for a 15-year term expiring on June 29, 2018, by President Bush. Nominated by President Trump for a second 15-year term on April 24, 2018. That nomination expired on January 3, 2019. Subsequently renominated on February 6, 2019. ^ "On the Nomination (Confirmation Neil M. Gorsuch, of Colorado, to be an Associate Justice of the Supreme Court of the United States)". United States Senate. April 7, 2017. Retrieved October 27, 2017. 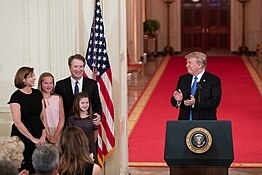 ^ "On the Nomination (Confirmation Brett M. Kavanaugh, of Maryland, to be an Associate Justice of the Supreme Court of the United States)". United States Senate. October 6, 2018. Retrieved October 6, 2018. ^ Sen. Lisa Murkowski (R-Alaska), who had announced her opposition to Kavanaugh's confirmation, voted "present" instead of "no" in order to acccomodate Sen. Steve Daines' (R-Montana) absence, as he would have voted "yes". See Pair (parliamentary convention). ^ "On the Nomination (Confirmation Amul R. Thapar, of Kentucky, to be United States Circuit Judge)". United States Senate. May 25, 2017. Retrieved October 27, 2017. ^ "On the Nomination (Confirmation John Kenneth Bush, of Kentucky, to be U.S. Circuit Judge for the Sixth Circuit)". United States Senate. July 20, 2017. Retrieved October 27, 2017. ^ "On the Nomination (Confirmation Kevin Christopher Newsom, of Alabama, to be U.S. Circuit Judge for the Eleventh Circuit)". United States Senate. August 1, 2017. Retrieved October 27, 2017. ^ "On the Nomination (Confirmation Ralph R. Erickson, of North Dakota, to be United States Circuit Judge for the Eighth Circuit)". United States Senate. September 28, 2017. Retrieved October 27, 2017. ^ "On the Nomination (Confirmation Amy Coney Barrett, of Indiana, to be U.S. Circuit Judge for the Seventh Circuit)". United States Senate. October 31, 2017. Retrieved October 31, 2017. ^ "On the Nomination (Confirmation Joan Louise Larsen, of Michigan, to be U.S. Circuit Judge for the Sixth Circuit)". United States Senate. November 1, 2017. Retrieved November 1, 2017. ^ "On the Nomination (Confirmation Allison H. Eid, of Colorado, to be United States Circuit Judge for the Tenth Circuit)". United States Senate. November 2, 2017. Retrieved November 2, 2017. ^ "On the Nomination (Confirmation Stephanos Bibas, of Pennsylvania, to be U.S. Circuit Judge for the Third Circuit)". United States Senate. November 2, 2017. Retrieved November 2, 2017. ^ "On the Nomination (Confirmation Gregory G. Katsas, of Virginia, to be U.S. Circuit Judge for the District of Columbia Circuit)". United States Senate. November 28, 2017. Retrieved November 28, 2017. ^ "On the Nomination (Confirmation Leonard Steven Grasz, of Nebraska, to be U.S. Circuit Judge for the Eighth Circuit)". United States Senate. December 12, 2017. Retrieved December 12, 2017. ^ "On the Nomination (Confirmation Don R. Willett, of Texas, to be a Circuit Judge, U.S. Court of Appeals for the Fifth Circuit)". United States Senate. December 13, 2017. Retrieved December 13, 2017. ^ "On the Nomination (Confirmation James C. Ho, of Texas, to be U.S. Circuit Judge for the Fifth Circuit)". United States Senate. December 14, 2017. Retrieved December 14, 2017. ^ "On the Nomination (Confirmation: David Ryan Stras, of Minnesota, to be U.S. Circuit Judge for the Eighth Circuit)". United States Senate. January 30, 2018. Retrieved January 30, 2018. ^ "On the Nomination (Confirmation: Elizabeth L. Branch, of Georgia, to be U.S. Circuit Judge for the Eleventh Circuit)". United States Senate. February 27, 2018. Retrieved February 27, 2018. ^ "On the Nomination (Confirmation Stuart Kyle Duncan, of Louisiana, to be United States Circuit Judge for the Fifth Circuit)". United States Senate. April 24, 2018. Retrieved April 24, 2018. ^ "On the Nomination (Confirmation Kurt D. Engelhardt, of Louisiana, to be U.S. Circuit Judge for the Fifth Circuit)". United States Senate. May 9, 2018. Retrieved May 9, 2018. ^ "On the Nomination (Confirmation Michael B. Brennan, of Wisconsin, to be U.S. Circuit Judge for the Seventh Circuit)". United States Senate. May 10, 2018. Retrieved May 10, 2018. ^ "On the Nomination (Confirmation Michael Y. Scudder, of Illinois, to be U.S. Circuit Judge for the Seventh Circuit)". United States Senate. May 14, 2018. Retrieved May 14, 2018. ^ "On the Nomination (Confirmation Amy J. St. Eve, of Illinois, to be U.S. Circuit Judge for the Seventh Circuit)". United States Senate. May 14, 2018. Retrieved May 14, 2018. ^ "On the Nomination (Confirmation Joel M. Carson III, of New Mexico, to be U.S. Circuit Judge for the Tenth Circuit)". United States Senate. May 15, 2018. Retrieved May 15, 2018. ^ "On the Nomination (Confirmation John B. Nalbandian, of Kentucky, to be U.S. Circuit Judge for the Sixth Circuit)". United States Senate. May 15, 2018. Retrieved May 15, 2018. ^ "On the Nomination (Confirmation: Mark Jeremy Bennett, of Hawaii, to be United States Circuit Judge for the Ninth Circuit)". United States Senate. July 10, 2018. Retrieved July 10, 2018. ^ "On the Nomination (Confirmation Andrew S. Oldham, of Texas, to be U.S. Circuit Judge for the Fifth Circuit)". United States Senate. July 18, 2018. Retrieved July 18, 2018. ^ "On the Nomination (Confirmation: Britt Cagle Grant, of Georgia, to be U.S. Circuit Judge for the Eleventh Circuit)". United States Senate. July 31, 2018. Retrieved July 31, 2018. ^ "On the Nomination (Confirmation A. Marvin Quattlebaum, Jr., of South Carolina, to be U.S. Circuit Judge for the Fourth Circuit)". United States Senate. August 16, 2018. Retrieved August 16, 2018. ^ "On the Nomination (Confirmation Julius Ness Richardson, of South Carolina, to be U.S. Circuit Judge for the Fourth Circuit)". United States Senate. August 16, 2018. Retrieved August 16, 2018. ^ "On the Nomination (Confirmation David James Porter, of Pennsylvania, to be U.S. Circuit Judge for the Third Circuit)". United States Senate. October 11, 2018. Retrieved October 11, 2018. ^ "On the Nomination (Confirmation Ryan Douglas Nelson, of Idaho, to be U.S. Circuit Judge for the Ninth Circuit)". United States Senate. October 11, 2018. Retrieved October 11, 2018. ^ "On the Nomination (Confirmation Richard J. Sullivan, of New York, to be U.S. District [sic] Judge for the Second Circuit)". United States Senate. October 11, 2018. Retrieved October 11, 2018. ^ "On the Nomination (Confirmation Jonathan A. Kobes, of South Dakota, to be U.S. Circuit Judge for the Eighth Circuit)". United States Senate. December 11, 2018. Retrieved December 11, 2018. ^ "On the Nomination (Confirmation: Eric D. Miller, of Washington, to be United States Circuit Judge for the Ninth Circuit)". United States Senate. February 26, 2019. Retrieved February 26, 2019. ^ "On the Nomination (Confirmation Allison Jones Rushing, of North Carolina, to be United States Circuit Judge for the Fourth Circuit)". United States Senate. March 5, 2019. Retrieved March 5, 2019. ^ "On the Nomination (Confirmation Chad A. Readler, of Ohio, to be United States Circuit Judge for the Sixth Circuit)". United States Senate. March 6, 2019. Retrieved March 6, 2019. ^ "On the Nomination (Confirmation Eric E. Murphy, of Ohio, to be United States Circuit Judge for the Sixth Circuit)". United States Senate. March 7, 2019. Retrieved March 7, 2019. ^ "On the Nomination (Confirmation Paul B. Matey, of New Jersey, to be U.S. Circuit Judge for the Third Circuit)". United States Senate. March 12, 2019. Retrieved March 12, 2019. ^ "On the Nomination (Confirmation Neomi J. Rao, of the District of Columbia, to be U.S. Circuit Judge for the D.C. Circuit)". United States Senate. March 13, 2019. Retrieved March 13, 2019. ^ "On the Nomination (Confirmation Bridget S. Bade, of Arizona, to be U.S. Circuit Judge for the Ninth Circuit)". United States Senate. March 26, 2019. Retrieved March 26, 2019. ^ "On the Nomination (Confirmation: David C. Nye, of Idaho, to be U.S. District Judge)". United States Senate. July 12, 2017. Retrieved October 27, 2017. ^ "On the Nomination (Confirmation: Timothy J. Kelly, of D.C., to be U.S. District Judge for the District of Columbia)". United States Senate. September 5, 2017. Retrieved October 27, 2017. ^ "On the Nomination (Confirmation: Scott L. Palk, of Oklahoma, to be United States District Judge for the Western District of Oklahoma)". United States Senate. October 26, 2017. Retrieved October 27, 2017. ^ "On the Nomination (Confirmation Trevor N. McFadden, of Virginia to be U.S. District Judge for the District of Columbia)". United States Senate. October 30, 2017. Retrieved October 30, 2017. ^ "On the Nomination (Confirmation Donald C. Coggins, Jr., of South Carolina, to be United States District Judge for the District of South Carolina)". United States Senate. November 16, 2017. Retrieved November 16, 2017. ^ "On the Nomination (Confirmation Dabney Langhorne Friedrich, of California, to be United States District Judge for the District of Columbia)". United States Senate. November 27, 2017. Retrieved November 27, 2017. ^ "On the Nomination (Confirmation William L. Campbell, Jr., of Tennessee, to be U.S. District Judge for the Middle District of Tennessee)". United States Senate. January 9, 2018. Retrieved January 9, 2018. ^ "On the Nomination (Confirmation Thomas Lee Robinson Parker, of Tennessee, to be U.S. District Judge for the Western District of Tennessee)". United States Senate. January 10, 2018. Retrieved January 10, 2018. ^ "On the Nomination (Confirmation Michael Lawrence Brown, of Georgia, to be United States District Judge for the Northern District of Georgia)". United States Senate. January 11, 2018. Retrieved January 11, 2018. ^ "On the Nomination (Confirmation Walter David Counts, III, of Texas, to be United States District Judge for the Western District of Texas)". United States Senate. January 11, 2018. Retrieved January 11, 2018. ^ "On the Nomination (Confirmation A. Marvin Quattlebaum, Jr. of South Carolina, to be U.S. District Judge for the District of South Carolina)". United States Senate. March 1, 2018. Retrieved March 1, 2018. ^ "On the Nomination (Confirmation Karen Green Scholer, of Texas, to be U.S. District Judge for the Northern District of Texas)". United States Senate. March 5, 2018. Retrieved March 5, 2018. ^ "On the Nomination (Confirmation Tilman Eugene Self III, of Georgia, to be U.S. District Judge for the Middle District of Georgia)". United States Senate. March 5, 2018. Retrieved March 5, 2018. ^ "On the Nomination (Confirmation Terry A. Doughty, of Louisiana, to be U.S. District Judge for the Western District of Louisiana)". United States Senate. March 6, 2018. Retrieved March 6, 2018. ^ "On the Nomination (Confirmation: Claria Horn Boom, of Kentucky, to be U.S. District Judge for the Eastern and Western Districts of Kentucky)". United States Senate. April 10, 2018. Retrieved April 10, 2018. ^ "PN988 — John W. Broomes — The Judiciary". United States Senate. September 7, 2017. Retrieved April 13, 2018. ^ "PN989 — Rebecca Grady Jennings — The Judiciary". United States Senate. September 7, 2017. Retrieved April 13, 2018. ^ "On the Nomination (Confirmation: Robert Earl Wier, of Kentucky, to be U.S. District Judge for the Eastern District of Kentucky)". United States Senate. June 5, 2018. Retrieved June 5, 2018. ^ "On the Nomination (Confirmation: Fernando Rodriguez, Jr., of Texas, to the United States District Judge for the Southern District of Texas)". United States Senate. June 6, 2018. Retrieved June 6, 2018. ^ "On the Nomination (Confirmation: Annemarie Carney Axon, of Alabama, to be U.S. District Judge for the Northern District of Alabama)". United States Senate. June 7, 2018. Retrieved June 7, 2018. ^ "PN1417 — Emily Coody Marks — The Judiciary". United States Senate. January 8, 2018. Retrieved August 1, 2018. ^ "PN1401 — Jeffrey Uhlman Beaverstock — The Judiciary". United States Senate. January 8, 2018. Retrieved August 1, 2018. ^ "PN1424 — Holly Lou Teeter — The Judiciary". United States Senate. January 8, 2018. Retrieved August 1, 2018. ^ "PN1331 — Colm F. Connolly — The Judiciary". United States Senate. December 20, 2017. Retrieved August 1, 2018. ^ "PN1336 — Maryellen Noreika — The Judiciary". United States Senate. December 20, 2017. Retrieved August 1, 2018. ^ "PN1338 — Jill Aiko Otake — The Judiciary". United States Senate. December 21, 2017. Retrieved August 1, 2018. ^ "PN1418 — Terry Fitzgerald Moorer — The Judiciary". United States Senate. January 8, 2018. Retrieved August 28, 2018. ^ "PN985 — R. Stan Baker — The Judiciary". United States Senate. September 7, 2017. Retrieved August 28, 2018. ^ "On the Nomination (Confirmation Charles Barnes Goodwin, of Oklahoma, to be U.S. District Judge for the Western District of Oklahoma)". United States Senate. August 28, 2018. Retrieved August 28, 2018. ^ "PN1399 — Barry W. Ashe — The Judiciary". United States Senate. January 8, 2018. Retrieved August 28, 2018. ^ "PN1198 — James R. Sweeney II — The Judiciary". United States Senate. November 1, 2017. Retrieved August 28, 2018. ^ "PN1329 — Susan Paradise Baxter — The Judiciary". United States Senate. December 20, 2017. Retrieved August 28, 2018. ^ "PN1643 — Nancy E. Brasel — The Judiciary". United States Senate. February 15, 2018. Retrieved August 28, 2018. ^ "PN1334 — Marilyn Jean Horan — The Judiciary". United States Senate. December 20, 2017. Retrieved September 6, 2018. ^ "PN1337 — William F. Jung — The Judiciary". United States Senate. December 21, 2017. Retrieved September 6, 2018. ^ "PN1332 — Kari A. Dooley — The Judiciary". United States Senate. December 20, 2017. Retrieved September 6, 2018. ^ "On the Nomination (Confirmation: Dominic W. Lanza, of Arizona, to be U.S. District Judge for the District of Arizona)". United States Senate. September 6, 2018. Retrieved September 6, 2018. ^ "On the Nomination (Confirmation: Charles J. Williams, of Iowa, to be U.S. District Judge for the Northern District of Iowa)". United States Senate. September 6, 2018. Retrieved September 6, 2018. ^ "PN1528 — Robert R. Summerhays — The Judiciary". United States Senate. January 24, 2018. Retrieved September 6, 2018. ^ "PN1649 — Eric C. Tostrud — The Judiciary". United States Senate. February 15, 2018. Retrieved September 6, 2018. ^ "PN1523 — Alan D. Albright — The Judiciary". United States Senate. January 24, 2018. Retrieved September 6, 2018. ^ "On the Nomination (Confirmation William M. Ray II, of Georgia, to be U.S. District Judge for the Northern District of Georgia)". United States Senate. October 11, 2018. Retrieved October 11, 2018. ^ "On the Nomination (Confirmation Liles Clifton Burke, of Alabama, to be U.S. District Judge for the Northern District of Alabama)". United States Senate. October 11, 2018. Retrieved October 11, 2018. ^ "On the Nomination (Confirmation Michael Joseph Juneau, of Louisiana, to be U.S. District Judge for the Western District of Louisiana)". United States Senate. October 11, 2018. Retrieved October 11, 2018. ^ "On the Nomination (Confirmation Mark Saalfield Norris, Sr., of Tennessee, to be U.S. District Judge for the Western District of Tennessee)". United States Senate. October 11, 2018. Retrieved October 11, 2018. ^ "On the Nomination (Confirmation Eli Jeremy Richardson, of Tennessee, to be U.S. District Judge for the Middle District of Tennessee)". United States Senate. October 11, 2018. Retrieved October 11, 2018. ^ "On the Nomination (Confirmation Thomas S. Kleeh, of West Virginia, to be U.S. District Judge for the Northern District of West Virginia)". United States Senate. October 11, 2018. Retrieved October 11, 2018. ^ "PN1519 — Jeremy D. Kernodle — The Judiciary". United States Senate. January 23, 2018. Retrieved October 11, 2018. ^ "PN1646 — Peter J. Phipps — The Judiciary". United States Senate. February 15, 2018. Retrieved October 11, 2018. ^ "PN1524 — Susan Brnovich — The Judiciary". United States Senate. January 24, 2018. Retrieved October 11, 2018. ^ "PN1335 — Chad F. Kenney — The Judiciary". United States Senate. December 20, 2017. Retrieved October 11, 2018. ^ "PN1831 — James Patrick Hanlon — The Judiciary". United States Senate. April 12, 2018. Retrieved October 11, 2018. ^ "PN1810 — Lance E. Walker — The Judiciary". United States Senate. April 10, 2018. Retrieved October 11, 2018. ^ "On the Nomination (Confirmation Roy Kalman Altman, of Florida, to be U. S. District Judge for the Southern District of Florida)". United States Senate. April 4, 2019. Retrieved April 4, 2019. ^ "On the Nomination (Confirmation: Daniel Desmond Domenico, of Colorado, to be U.S. District Judge for the District of Colorado)". United States Senate. April 9, 2019. Retrieved April 9, 2019. ^ "On the Nomination (Confirmation: Patrick Wyrick, of Oklahoma, to be U.S. District Judge for the Western District of Oklahoma)". United States Senate. April 9, 2019. Retrieved April 9, 2019. ^ "On the Nomination (Confirmation: Holly A. Brady, of Indiana, to be U.S. District Judge for the Northern District of Indiana)". United States Senate. April 10, 2019. Retrieved April 10, 2019. ^ "On the Nomination (Confirmation: David S. Morales, of Texas, to be U.S. District Judge for the Southern District of Texas)". United States Senate. April 10, 2019. Retrieved April 10, 2019. ^ "PN869 — Elizabeth Ann Copeland — United States Tax Court". United States Senate. August 3, 2017. Retrieved August 28, 2018. ^ "PN870 — Patrick J. Urda — United States Tax Court". United States Senate. August 3, 2017. Retrieved August 28, 2018. ^ "PN591 — Michael P. Allen — The Judiciary". United States Senate. June 7, 2017. Retrieved April 14, 2018. ^ "PN592 — Amanda L. Meredith — The Judiciary". United States Senate. June 7, 2017. Retrieved April 14, 2018. ^ "PN593 — Joseph L. Toth — The Judiciary". United States Senate. June 7, 2017. Retrieved April 14, 2018. ^ "PN1529 — Joseph L. Falvey Jr. — The Judiciary". United States Senate. January 24, 2018. Retrieved April 26, 2018. ^ "PN1055 — Gregory E. Maggs — The Judiciary". United States Senate. October 2, 2017. Retrieved April 14, 2018. "Judges of the United States Courts". Biographical Directory of Federal Judges. Federal Judicial Center. Archived from the original on November 10, 2017. Retrieved January 31, 2017. "Ratings of Article III and Article IV Judicial Nominees" (PDF). American Bar Association. Retrieved November 10, 2017. ^ Victor, Jennifer (October 8, 2018). "Lisa Murkowski's unusual vote on Kavanaugh, explained". Vox. Retrieved March 12, 2019.